IoT Healthcare Market size was valued at over USD 2 billion in 2016 and will grow at more than 15% CAGR estimation from 2017 to 2024. Increasing demand for remote monitoring of patients will propel the adoption of IoT healthcare market over the forecast timeline. The deployment of IoT based solutions across the industry is anticipated to bring in high degree of automation, reduce operating costs and enhance the decision-making process. Rising penetration of smart wearables for monitoring bodily activities & analyze the data from these devices to optimize efficiency will drive the IoT healthcare market growth. Implementation of these solutions in the sector will enhance the patient interactions, streamline workflows and improvise the operational efficiency. For instance, the use of such technology allows monitoring of patients and provide ongoing care from a clinic or from an ambulance. IoT has capabilities of minimizing the risk with location services where patient’s movements and reachability to other objects and individuals are tracked. Network management platform is anticipated to witness growth over the forecast timeframe. The growth is attributed to the visibility provided by the connected devices communicating in a network. These platforms enable healthcare organizations to gain control over the devices connected as well as the network. The use of network management platforms offers unprecedented access to crucial information related to patient health. Rising demand for management of devices operating in the system further contributes to the growth of IoT healthcare market. Increasing adoption of technologies such as sensors in various devices across the healthcare industry will drive the IoT healthcare market growth. These technologies enable the devices to gather and share data among each other as well as the cloud for data collection and analysis. With the advancements in sensor technology, miniaturization of devices communicating wirelessly is effective in nature and performs without user intervention. These technologies are capable of collecting patient data in order to perform diagnostic, preventive care as well as for treatment results. The data collected in real-time are used for improving the efficiency & quality of processes with low possibility of errors. Hardware segment dominates the industry with majority of the revenue share and is expected to witness considerable growth over the forecast timeframe. The demand for better diagnostics are addressed with the introduction of digital technology. The smart wearable devices offer advantages such as remote patient monitoring to the physicians and fitness trackers for the athletes. Increasing penetration of smart devices across the industry further contributes to the growth of IoT healthcare market. Managed services segment is set to witness high demand over the forecast timeline. The growth of this segment is attributed to the capability of the Managed Service Providers (MSP) to implement and deploy crucial business solutions. The use of managed services in healthcare sector is on the rise owing to the benefits offered such as cost optimization and risk minimization. Features such as reduction of total cost of ownership, continuous improvement as well as improvised data privacy ensuring the confidentiality of the data, is expected to fuel the demand for managed services segment in the IoT healthcare market. Telemedicine segment accounted for majority of the share by revenue in the IoT healthcare market. This is attributed to the advantages offered such as improved security & privacy followed by the faster scalability to meet demands from a number of customers. It allows the exchange of data such as health status of patients from one point to another through a telecommunication network resulting in enhanced efficiency with cost effectiveness. These solutions can be used in remote areas by integrating devices with satellite communication providing more convenient access. 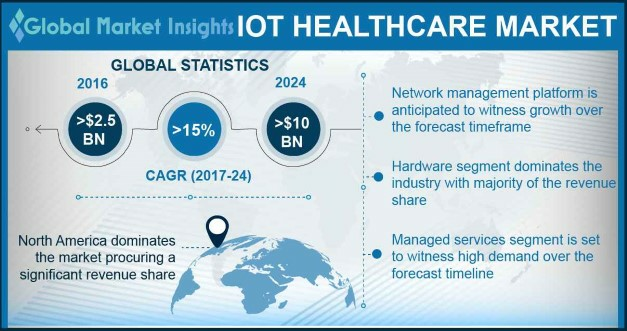 North America dominates the IoT healthcare market with significant revenue share. The growth is attributed to the presence of large number of advanced infrastructure in the region. Advancements in technology and devices coupled with rising spending on the infrastructure further contributes to the market growth. Asia Pacific IoT healthcare market is expected to witness significant growth owing to rising number of medical facilities. Moreover, the increasing investment in the sector to improve the infrastructure and address issues such as corruption, several countries are planning to introduce innovative models such as e-catalogs and price transparency procedures that will contribute in the demand for advanced solutions. Industry participants in the IoT healthcare market include IBM Corporation, Cisco Systems Inc., General Electric, Microsoft Corporation and Honeywell International Inc, SAP SE, Qualcomm Inc., Medtronic Inc. and Stanley Healthcare. The players operating in the industry are focusing on connected sensor technology in order to monitor, diagnose, manage patients as well as treatments in a better way. Moreover, they are offering solutions to analyze sensor data from healthcare facilities for optimizing the operational efficiencies. A connected medical facility leverages smart solutions in order to allow secure and real-time data flow across various networks. The new generation of digital technology has the potential to reshape the healthcare sector by offering benefits such as customization of various services, clinical diagnosis, remote visibility and many others. The industry is majorly affected by factors such as government regulations. It is characterized by heavy spending on R&D. With increased emphasis on development of healthcare infrastructure across various regions, IoT has huge potential to grow. Implementation of IoT across the sector is anticipated to boost the process efficiencies, improve patient outcomes and the streamline the overall workflow.